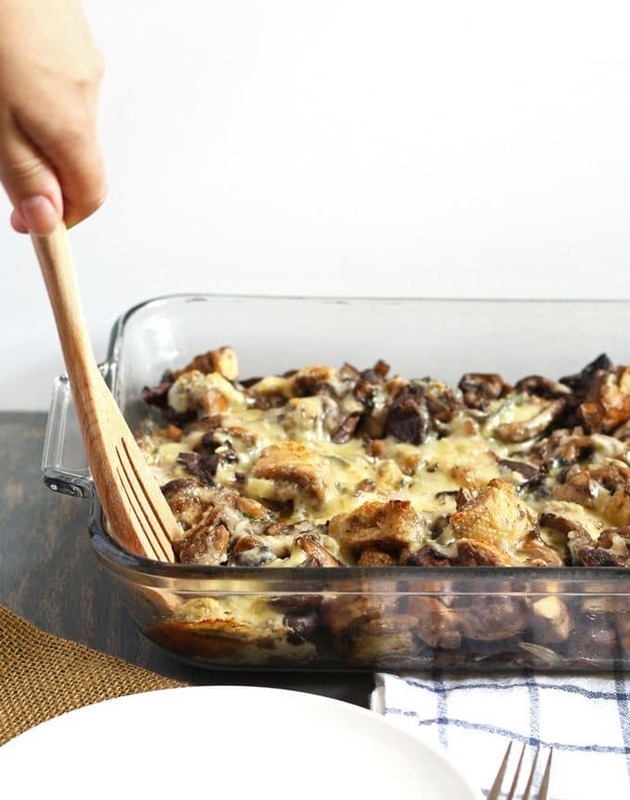 This mixed mushroom casserole is perfect for holiday dinners! It’s hearty and delicious! 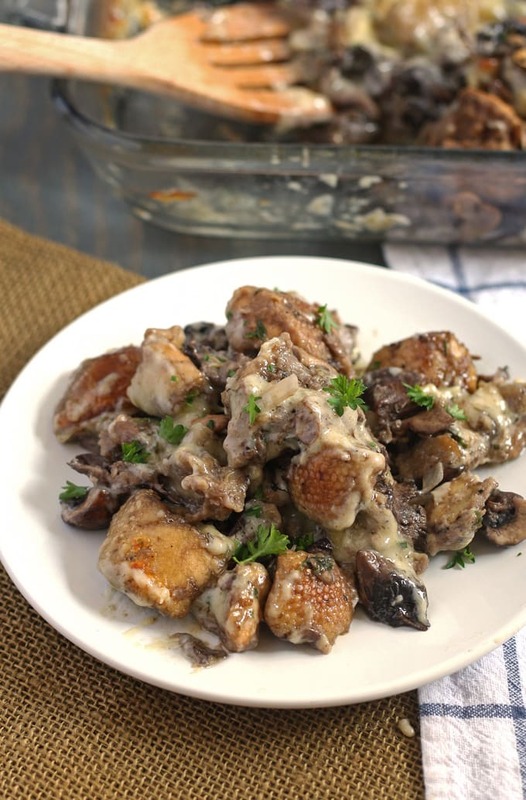 Today I am sharing with you the last recipe in my unintentional mushroom series. In case you don’t know what I’m talking about – I sent my hubby shopping and he came with pounds and pounds of mushrooms for me. I only intended to make mushroom soup. 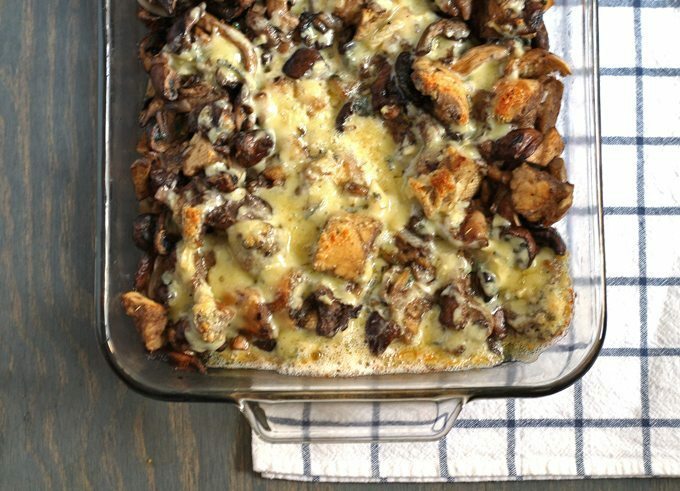 To use up the mushrooms before they spoiled, I first made the soup, followed by some stuffed mushrooms and ending with this mixed mushroom casserole. And this baby is delicious. It is perfect for special occasions. Like a fancy dinner or a dinner where you want to impress someone. It would also be great for Thanksgiving – it is a huge dish and would be lovely as a replacement to stuffing. But it takes a long time so don’t get mad at me if you are in the kitchen slaving over the stove for this one. Each stir of the spoon is worth it though (you’ll see what I mean when you make the sauce) – I invited my neighbor over for dinner the night I made this and he freaked out about it. Well, that’s a bit of an exaggeration. But he did say it was delicious and he did stop eating everything else so he could just eat this casserole. Totally worth the time it took to make it. Bam. Your neighbors will love it too. Heat your oven to 375 degrees F. Grease a large casserole dish and set aside. Spread the bread cubes on a baking sheet and bake for 10 minutes (or until the are golden brown.) Transfer to a large bowl and set aside. In a large pan, heat the butter and olive oil until it begins to foam. Add all of the mushrooms and cook. Stir once in awhile, until the mushrooms are golden brown - about 10-12 minutes. Add the white onion, parsley and dried thyme. Stir to combine and cook for about 1 minutes. Add the wine and scrape the bottom of the frying pan to remove any bits that have stuck. Cook until the wine has mostly evaporate. Season with salt and pepper to taste. Add the mushroom mixture to the bowl with the bread cubes. Add the beaten egg, stirring to combine. 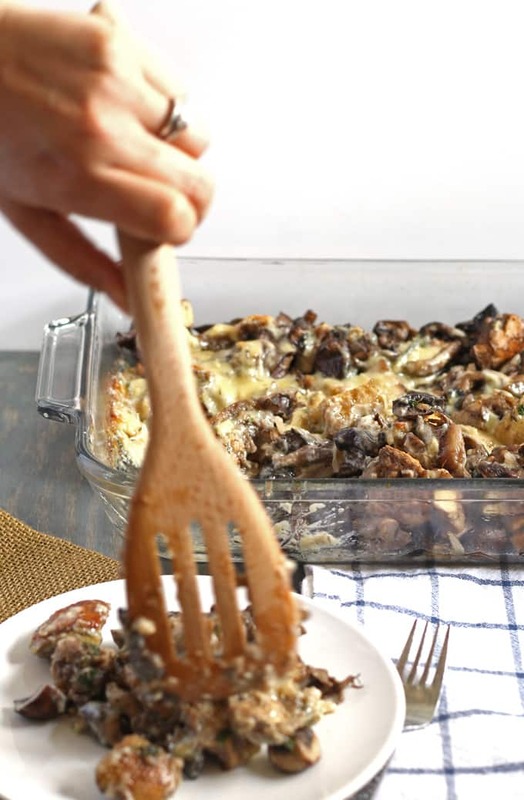 Pour the mushroom mixture into the casserole dish. In the frying pan that you cooked the mushrooms in, over medium heat, add the cream. Bring it to a simmer, then add the cheese 1 cube at a time. Whisk constantly until the cube has melted. Continue with the each piece of cheese, whisking constantly. When the cheese is melted, season with salt and pepper to taste. 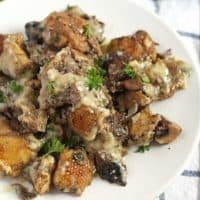 Pour cheese sauce over the mushrooms and bread. Bake for 20 minutes. Remove and serve. That looks delicious. When I saw the photo, I thought it was a slow cooker chicken and stuffing recipe. I may have some problems cooking this since it’s fairly involved. Maybe I can get my husband to make it. Thanks for the recipe. Lisa, it is more complicated than the recipes I normally share but it is totally worth the time and trouble! Perfect timing! I have been craving fresh mushrooms for the past few days. Yum. That looks amazing! We love casserole dishes! I love mushrooms so much. My youngest son does too, but the rest of the family doesn’t. I might have to make this for the two of us…it looks so good. I think I am going to! Pinning! It’s hard when the whole family doesn’t like mushrooms – this is a large dish, so I would probably half it if part of the family is anti-mushroom. I can’t to hear how you like it! 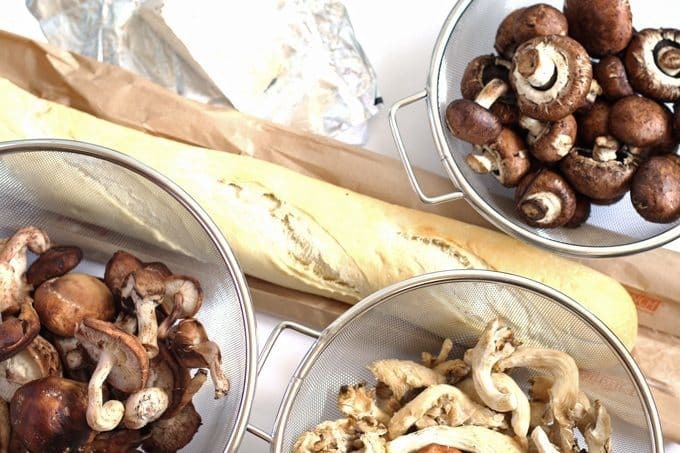 Oh my god… mushrooms, wine, and brie in one dish? This sounds like heaven; can’t wait to try and make it for Thanksgiving this year! I love mushrooms! Would love to give this a try! I’ve never combined mushrooms in a dish but this looks like it would go well with a steak. Wow, this looks really good. I love mushrooms. It does seem a bit more involved than what I would normally do, but sometimes it’s definitely worth it. Thanks for the recipe! You’re welcome Denise – enjoy! I love mushrooms. This recipe sounds great and the photo’s have literally got my stomach making some odd noisese!. I can’t wait to try this. So excited to try this! This looks delicious. 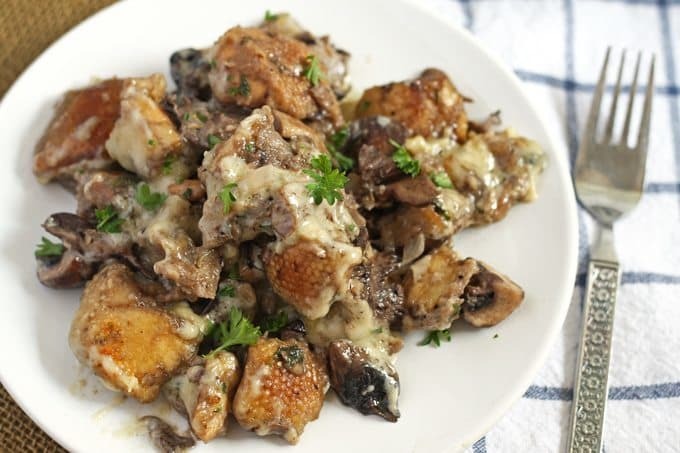 You had me at mushrooms and then i saw the blue brie cheese in it. Mhmm, heaven! Will definitely try this out asap! I wil have to send this to my dad . He’s growing mushrooms in every spare corner of the house. It’s making my mom crazy, but he is harvesting some amazing mushrooms. Maybe he’ll bring a bucketful. I have to try it. Seems just a little bit complicated but it also seems too delicious to not to try it. 🙂 Thank you for sharing. Thank you! It is a little complicated (and more complicated than the recipes I usually share…) but it’s totally worth it! Mushrooms are one of my favorite treats. This looks delicious! Thanks for sharing at Foodie Fridays. I look forward to seeing your fabulous recipes again this week.